The above examples clearly demonstrate that the gender wage gap is not unique to the United States, where women still earn 80 percent of what men earn. 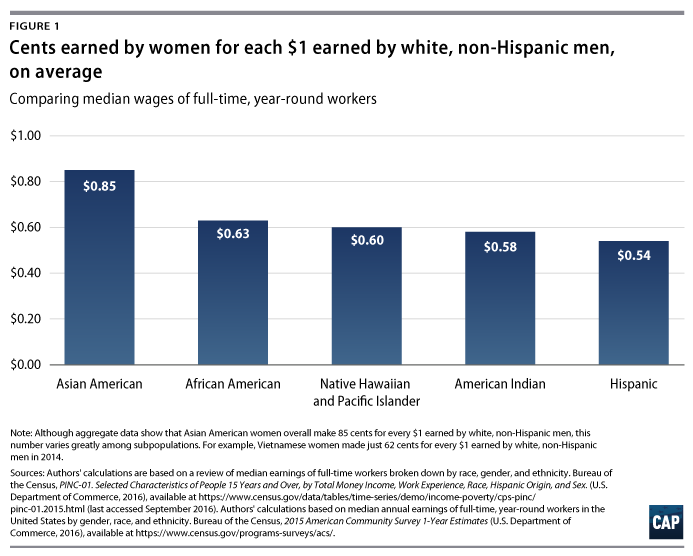 In American households, more than two-thirds of mothers are the primary or co-breadwinners for their families, meaning that the gender wage gap hits working families particularly hard.3 Moreover, the wage gap is even worse for women of color, as Figure 1 highlights. For example, on average, African American women earn 63 percent and Hispanic women earn just 54 percent of what white, non-Hispanic men do. Despite considerable national differences in the severity of the gender wage gap around the world, a study by the World Economic Forum, or WEF, suggests that the wage gap will take decades to close in almost every country. According to the WEF, if the gender wage gap continues to close at its current rate in each region, it may take anywhere from 46 to 158 years for countries across the globe to eliminate the gap. North America—defined as Canada and the United States in the report—is at the far end of that continuum: It is not projected to close its gap for another 158 years.5 The good news is that many countries have taken innovative steps to shrink the gap, making critical progress not just for women but for working families across borders. This issue brief outlines how other countries have taken action to diminish the gender wage gap. The intent of this brief is not to be a comprehensive guide detailing the policies other countries use to address pay equity but rather to offer examples and overall trends of international approaches to the gender wage gap, with a particular focus on OECD countries, which are economically similar to the United States. In doing so, it may offer insight as to how the United States can adopt policies to address its own gender wage gap. Despite extensive research on the nature and drivers of the gender wage gap within and between countries, a large portion still cannot be explained. 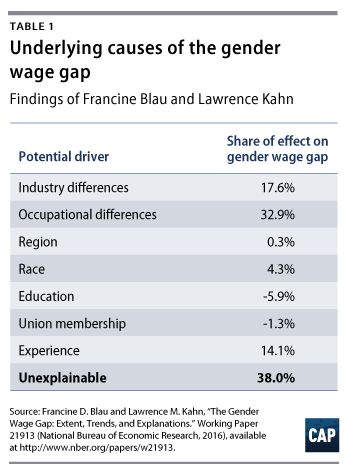 Blau and Kahn found that in the United States, 38 percent of the gap is unexplained by industry, occupation, education, experience, union, or demographic factors.13 Another study by Glassdoor of its compiled salary data also found that 33 percent of the pay gap between men and women is unexplained.14 While laws that raise the minimum wage; strengthen collective bargaining; provide paid sick days and paid family and medical leave; and ensure affordable childcare are all important aspects of closing the wage gap, the fact that such a large percentage of the gap cannot be explained underscores the need for policies directly targeting discrimination in order to completely eliminate the gap. Unequal pay can be battled with anti-discrimination efforts, but closing the gender wage gap requires anti-discrimination efforts as well as a broader suite of work-life policies, such as paid family and medical leave, paid sick days, and affordable child care. While achieving progress on work-life and anti-discrimination policies has been all but impossible in the United States with recent congressional polarization, other countries have made progress on both fronts. Many countries are addressing both facets of the gender wage gap, as they have implemented both work-life supports and innovative solutions to combat wage discrimination. In addition to implementing work-life supports, most developed and developing countries have taken innovative steps to close the gender wage gap. A few recent policy trends have emerged from those solutions. They include, but are not limited to: protecting workers from employer retaliation for discussing wages; expanding employer pay data collection efforts; implementing equal pay for work of equal value guidelines; using gender-responsive budgeting; providing credits for caregivers; and bolstering damages for victims of wage discrimination. Although it may be too early to tell which of these policies are the most effective in eliminating the gap, it may be useful for U.S. policymakers and researchers to keep an eye on how each of these efforts unfold. Many countries have required some type of pay data reporting—to government authorities or publicly— for years. For example, Austria, Belgium, Sweden, Denmark, and Portugal have implemented their own versions of this policy.23 Generally, pay data reporting is the process of requiring or incentivizing employers to collect and provide their pay data to government bodies, but the details can vary greatly from country to country. Reporting requirements hold employers accountable to examine and address their own pay practices. Gender audits are another effort to collect pay data and other information within workplaces. Employers in many countries such as Spain, Denmark, and Belgium are required—or volunteer—to evaluate their own practices through a gendered lens.24 This process is referred to as a “gender audit” and is often related to pay data reporting. Gender audits are a type of social audit—rather than a solely financial audit—that aims to determine the effectiveness of gender equality programming.25 In the United States, federal contractors are required to conduct internal audits to ensure nondiscriminatory practices have been followed.26 However, these requirements have not been extended to other businesses, and there are often issues with compliance and enforcement. Additionally, many of these employers are required to come up with a gender action plan if they indeed find a gender wage gap. If an employer in a country with this regulation fails to adhere to the rule, there can be consequences. 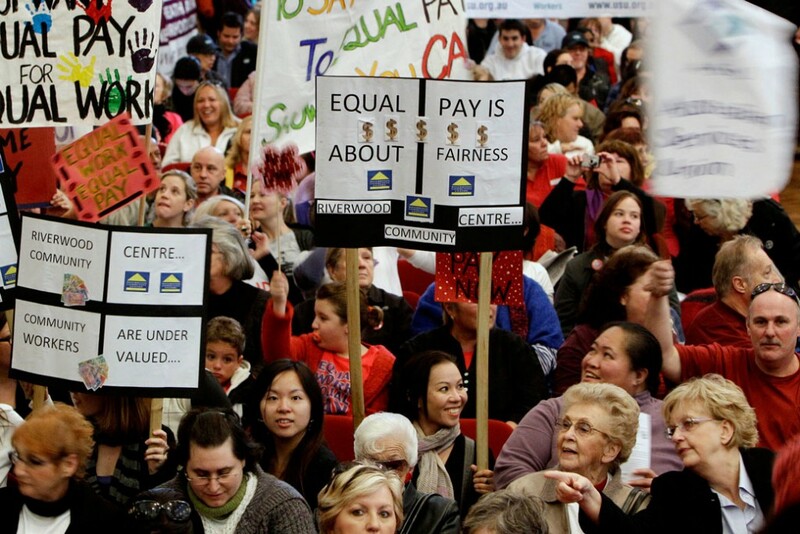 In Denmark, for example, the Equal Pay Act 2014 fines businesses with more than 10 employees if they fail to comply with gender audits of their own workforce.27 Governments may also hold businesses accountable by requiring employers to post their pay data publicly, thereby creating an incentive for employers to analyze and correct their own pay practices before wage gaps are publicly revealed. Although implementing a proactive approach to pay discrimination is important, some countries have simultaneously bolstered damages for people who have suffered wage discrimination. One example of such a meaningful increase is Israel’s 2014 amendment to the Equal Pay Law. The amendment ensures that damages are paid to women not only for their personal experience with wage discrimination but also for the existence of wage discrimination in their workplace generally.44 Moreover, in Cyprus, Iceland, Lithuania, and Romania, additional compensation is awarded to victims of pay discrimination for moral damages.45 Increasing damages meaningfully for victims may help deter employers from using unfair pay practices. At the United Nations’ 1995 Fourth World Conference on Women in Beijing, gender-responsive budgeting became part of the platform for action, explicitly encouraging countries to incorporate working women’s needs and interests into their budgets.46 This process has also been referred to as gender budgeting, gender mainstreaming, or gender-sensitive budgeting. The first example of this policy came prior to Beijing, when Australia implemented gender-responsive budgeting in 1983. The major product of the Australian effort is an annual government report—the Women’s Budget Statement—that assesses the impact of the national budget on women. The Women’s Budget Statement divides expenditures into three categories: gender-specific expenditures, equal-opportunity expenditures for civil servants, and gender expenditures considered in terms of their gender impact. Although the annual report is globally innovative, critics points out that it is biased toward emphasizing government successes, and they highlight the need for both government and outside civil groups to participate in gender-responsive budgeting for it to be successful.47 While it is not a perfect solution, the broader point is that it can be helpful for governments to show their commitment to focusing on gender equality within their budgets. While these laws lay a foundation for equal pay protections, there is still much progress to be made. A patchwork of policies across states and cities is helpful but ultimately insufficient, as many women and families fall through the cracks. Although the Obama administration advanced executive actions to help diminish the gap, many gaps still exist within older federal protections. To finally eliminate the gender wage gap, we need a robust federal policy approach that reflects the realities of today’s needs. What can U.S. policymakers do about it? Among bills on the table that would help fill in the gaps, the Paycheck Fairness Act—introduced by Rep. Rosa DeLauro (D-CT) and Sen. Barbara Mikulski (D-MD) in 2015 and in every Congress since 1997, falling just two votes shy of passing in 2009—and the Pay Equity for All Act of 2016—introduced by Rep. Eleanor Holmes Norton (D-DC) in 2016—would bolster wage protections for workers.63 The Healthy Families Act, introduced by DeLauro and Sen. Patty Murray (D-WA) in 2015, and the Family and Medical Insurance Leave Act, introduced by Sen. Kirsten Gillibrand (D-NY) in February 2017 and currently pending in the 115th Congress, would allow workers to take paid time off to recover from short- and long-term illnesses and care for loved ones.64 Although these pieces of legislation could work together to close the gender wage gap in the United States, they have not been passed by Congress. Like Iceland, the countries highlighted in this brief—among many others—have implemented both work-life supports and wage discrimination protections that are critical to closing the gender wage gap.66 This means that the United States is now falling behind not just on economic policies that support working families but also on solutions that directly target wage discrimination. As with other policy areas, it is important that U.S. lawmakers consider other nations’ comprehensive innovations, learn lessons from how they unfold, and implement robust solutions for working families at home. Kaitlin Holmes is a Research Assistant for the Women’s Initiative at the Center for American Progress. Danielle Corley is a Research Associate for Women’s Economic Policy at the Center.